In 2001 the City of Vestavia Hills contacted Nimrod Long and Associates, Inc. to prepare a Walkway Master Plan for the city. 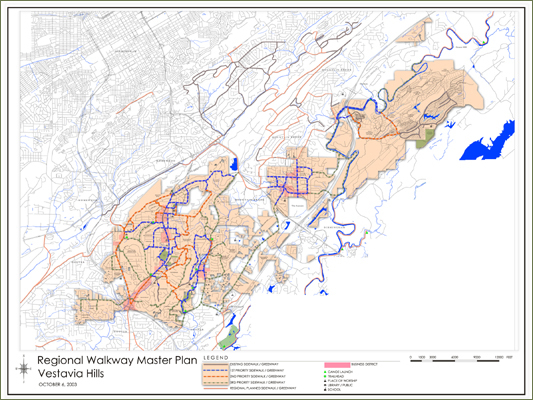 The goal of the Master Plan was to unite the community by creating sidewalks, trails, and greenways between neighborhoods, schools, and commercial districts. The rapid growth of the city in the last decade with its convenient location to downtown was causing increased traffic and disconnects between these areas. A group of citizens and city staff worked with NLA to assess neighborhood needs and provide input for the Master Plan. In addition to the citizens and city staff input, two community meetings were conducted by NLA to gain public commentary for the preliminary Master Plan drawings. Funding for portions of the Master Plan was provided by federal grants and city funding. NLA will continue to assist the City with applications for federal funding as future sources of money are identified. © Copyright 2019 Nimrod Long and Associates. All Rights Reserved.